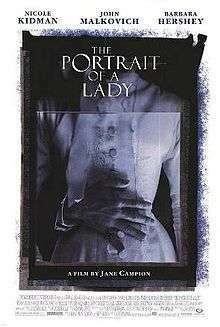 The Portrait of a Lady is a 1996 film adaptation of Henry James's novel The Portrait of a Lady directed by Jane Campion. The film stars Nicole Kidman, Barbara Hershey, John Malkovich, Mary-Louise Parker, Martin Donovan, Shelley Duvall, Richard E. Grant, Shelley Winters, Viggo Mortensen, Valentina Cervi, Christian Bale, and John Gielgud. The film tells the story of Isabel Archer (Kidman), an innocent young woman of independent means who is manipulated by her "friend" Madame Merle (Hershey) and the devious Gilbert Osmond (Malkovich). The Portrait of a Lady received mixed reviews from critics, as it holds a 43% rating on Rotten Tomatoes based on 28 reviews. On December 11, 2012, Shout! Factory released The Portrait Of A Lady: Special Edition on DVD and Blu-ray.